After missing nearly a quarter of the season with a high ankle sprain, Sidney Crosby looked as strong as ever in leading the Pittsburgh Penguins to a victory in his first game back. The reigning NHL scoring champion and MVP was far from satisfied with the performance, however. After his first game in 6 1/2 weeks, Crosby looks to help the Eastern Conference-leading Penguins to their first season sweep of the Florida Panthers in Thursday night's matchup. On Jan. 18, Crosby injured his ankle when sliding into the boards at Mellon Arena, and he wasn't expected to return until this weekend. Before Tuesday's game at Tampa Bay, though, Crosby announced he would be ready to play after unexpectedly taking part in the pregame skate. Crosby immediately made an impact, setting up Maxime Talbot for the winning goal with 2:47 remaining. Evgeni Malkin added an empty-net goal with 5 seconds left as the Penguins (38-23-7) won 2-0. Pittsburgh moved two points ahead of Northeast Division-leading Montreal atop the East, and maintained its one-point lead over New Jersey in the Atlantic Division. The Penguins stayed in the hunt for the top seed in the conference by going 11-6-4 without Crosby. On Tuesday, Crosby created numerous scoring opportunities with his speed and stickhandling, but the 20-year-old star center was disappointed over some missed opportunities. While Crosby feels he has a long way to go to regain his form, goaltender Marc-Andre Fleury has been outstanding since returning from an ankle injury he suffered Dec. 6. Fleury made 35 saves Tuesday for his third shutout of the season, and has stopped 66 of 68 shots in two starts since returning from the injury. He's won six straight decisions, posting a 0.97 goals-against average and two shutouts in seven starts in that span. Fleury has not faced the Panthers this season. He's 1-2-0 with a 3.63 GAA and one shutout lifetime against them. The Penguins won the first three meetings of the season with the Panthers (30-31-8) and have five straight victories in the series. Pittsburgh has outscored Florida 14-4 during the winning streak. Crosby has two goals and two assists in two games against the Panthers this season, and five goals and nine assists in 10 career matchups. Malkin was instrumental to the Penguins' success while Crosby was out, recording 14 goals and 22 assists in those 21 games. His 89 points are second most in the league behind Washington's Alexander Ovechkin. Malkin has a goal and four assists against Florida this season. Crosby and Malkin, however, may have a tough time scoring Thursday with the way goalie Craig Anderson has been playing. After making 53 saves in Sunday's 1-0 victory over the New York Islanders - the most in a shutout since shots on goal started being kept as a statistic in the 1955-56 season - Anderson stopped 40 shots in the Panthers' 1-0 overtime win over Boston on Tuesday. Anderson, the backup to All-Star Tomas Vokoun, has stopped more shots in consecutive shutouts than any goalie. "Who would have ever thought, with all the great goalies that have ever played this game and will play this game, that I'd be the guy you'd be talking to right now about this? It's definitely an honor," Anderson said. "I'm glad to be a part of it." Panthers coach Jacques Martin will likely give Anderson, who has stopped 105 consecutive shots over 147 minutes, 46 seconds, another start Thursday. 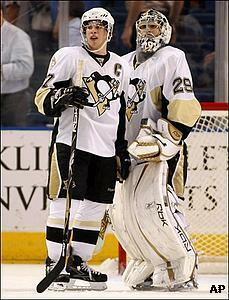 Vokoun has posted a 3.76 GAA in losing his last six starts. Anderson has not started against Pittsburgh since March 23, 2003, when he made 27 saves for Chicago in a 1-all tie. Nathan Horton scored his 22nd goal of the season 22 seconds into overtime Tuesday, but has been held without a goal in his last eight games against the Penguins. The Panthers, tied with Toronto for 12th place in the East, are opening a season-high seven-game homestand.